Surprisingly, there has been considerable fanfare behind the idea of an ASEAN minimum wage, with Cambodia and Vietnam among those showing support. However, the extent of regional commitment remains to be seen as nations continue to compete for capital inflows brought on by a number of pending trade agreements and relatively competitive workforces. Beyond doubts over the willingness of nations to implement a minimum wage, questions also arise over the current capacity of ASEAN as a whole to institute regional standards of this magnitude. From the perspective of investment, collective commitments to a regional wage minimum bring up important questions over the structure of wage floors within ASEAN. With regard to regulation as a whole, talk of a minimum wage also necessitates reflection on the ability of ASEAN’s current treaty structure to institute and enforce regulations of this magnitude. As eluded to by Indonesia, the contrast in wages between ASEAN member states is significant, and much more prominent than in other regions of the world such as the European Union. With compensation starting at US $2.74 an hour in Myanmar and ending well over US $10 in the Philippines*, it is almost inevitably that labor intensive production will gravitate towards lower cost jurisdictions. While a flow of capital towards lower wage destinations may take place in certain industries, leaving a country is not always the only option available to investors. In many of ASEAN’s emerging markets, wages are set at a regional level rather than nationally and can offer a wide range of options for cost sensitive investors. Indonesia is a good example of this. Although its more affluent city centers will most likely be overlooked when their wages are compared to those found in Cambodia and Vietnam, certain areas of the archipelago offer wages at a level comparable to Myanmar – ASEAN’s cheapest source of labor. In addition to providing investors domestic opportunities to pursue lower cost production, the variety of wages found within ASEAN states can provide significant opportunities to incentivize investment in underdeveloped regions. While the lowered costs of these locations may override the lack of infrastructure in the status quo, a regional minimum sufficient to divert Vietnamese investments to Indonesia would likely result in substantial increases in costs of doing business. The spread of minimum wages between ASEAN states is a telling sign of the economic diversity found within the region. While efforts to create a minimum standard may benefit workers in the lowest income brackets, many investments would see little impact from wage hikes. Malaysia is a prime example. Despite having a GDP per capita that is second only to Singapore, its minimum wage falls below that of the Philippines and Thailand. While in theory, workers could be paid less within Malaysia, the majority of production is concentrated within sectors where workers are paid above the minimum wage. Furthermore, although low compared to regional competitors, Malaysia’s minimum wage is far above minimums found within Vietnam, Cambodia, and the lower end of Indonesia’s spectrum. As a result, the imposition of a regional minimum created to protect workers in within these countries would have little direct impact on the labor costs for Malaysian based producers. This would be particularly true of those involved in the nation’s key exports of electronics, integrated circuits, and video components. A more important consideration is that of supply chain integration. For those sourcing components from low-cost production hubs throughout the region, minimum wage hikes may have the unintentional consequence of increasing end product costs. Depending on where a regional minimum is set, it is entirely possible that key locations or entire supply chains could become uncompetitive in relation to Chinese-based production. 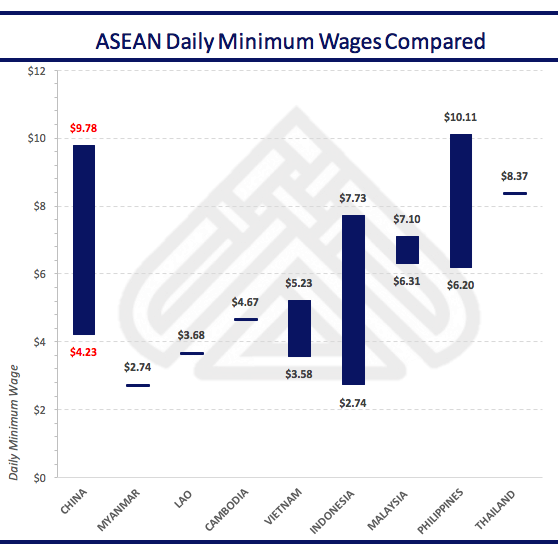 Although understanding the impact of an ASEAN minimum wage is important and has certainly grabbed headlines, there are a number of obstacles to implementing such a policy in a manner similar to the minimum wages currently employed within sovereign nations. At the core of this roadblock is the structure of ASEAN as a regional body. Unlike a centralized governing body or even a more structured regional body such as the EU, ASEAN currently lacks the power to enforce its own standards. Nations within the regional bloc currently operate on a policy of consensus and non-interference, which prevents one nation from imposing its will on another. The creation of a minimum wage standard would therefore be impossible without a consensus between ASEAN leaders and improbable given heightened levels of competition seen between ASEAN member states in the recent past. The utility of wages as a tool to attract investors is only set to grow as the ASEAN Economic Community (AEC) brings other aspects of ASEAN nations into harmony. A more tenable course of action that has been suggested within the context of minimum wage discussions is a regional commitment to avoiding lowering minimum wages in the future. As wage growth and investment have been increasing throughout the region, this is likely to be a much easier sell to regional leaders. In addition to necessitating little action in the near to medium term, an agreement of this nature would be largely symbolic and do little to guide future decision making concerning the rate at which wages should be raised to combat domestic issues such as inflation and currency volatility. *Singapore currently does not employ a minimum wage but generally pays well above minimum wages found within other ASEAN states.